Oprah Winfrey is constantly held up as this pinnacle of goodness. Helping women to 'find their true selves' and positioning herself as the new age guru for all females -- she has a corner on the chick market like no one else. Oprah picks a novel for her show's book club, women rush out & catapult it to the top of the best seller's list. Ah, the power - so am I the only one to see that she's abusing this power? 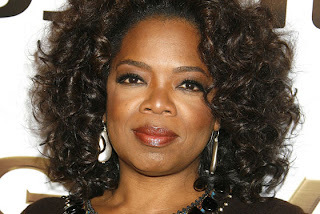 Oprah, the warrior for all women, will NOT allow Republican VP candidate, Sarah Palin, to visit her insipid chat show. WHY? Why would Oprah turn away the new female star of US politics? Doesn't Oprah want to shine the spotlight on a woman doing it right? One word: Obama! Oprah is one of the most vocal supporters of Barrack and she's letting her political posturing get in the way of honest journalism, you know...showing both sides to a story, being objective -- that type of thing. Plus, she's letting down her female viewership. Regardless of how you feel about Sarah Palin and her beliefs, as a woman her story is interesting. A strong, successful woman with five kids making it happen in a (predominantly) male-hued world. If Oprah was there for *every* woman like she spouts that she is, she'd invite Palin to her sofa and see what she has to say. Instead, she's only telling one side to this story -- the one she favours. She wants Obama to win so the hell with the women's new age guru role (at least for now until she has a new tv show, magazine or other enterprise to sell to the masses). Shame on you, Oprah! I'm not buying what you're selling!